Why not, I thought. I’d dipped in and out of watching tennis over the years, or as much as my adoration for a certain American rock band allowed. My late mum adored it, plus I had an aunt who also loved it and went as often as she could get ballot tickets. I’d never harboured any great desire to go, but I loved hearing about it all from her. Seemed like a good distraction from the football stress coming from the other room. It wasn’t very long before the young, brash upstart made an impression on me. Yes, I fully admit to being dazzled by the very obvious physical attributes he was blessed with, along with the long flowing locks and unusual tennis attire. But I became quickly enthralled with his scampering all over the court to run down anything and everything, the ridiculous angles he could hit from and the ever present fist-pumping. I can’t say exactly when the dream of a fairy-tale ending dissolved and the swelling of hope that the upstart would triumph happened, but it was definitely there before the end of Set 1. As the match continued to its conclusion, questions started swirling around my mind. Where could I find out more about this young upstart? How can I get to see some of his previous matches? Who will he play next? These and other questions were still on my mind as they shook hands over the net, Agassi’s Wimbledon career over and the upstart victorious. But then I noticed other things, which made more of an impression on me at that moment. No wild celebrations of victory, a gentle nudge from Rafa to Andre to shake hands with the umpire first. Sue Barker, from BBC TV took to the court to interview the players, breaking with Wimbledon tradition to come and interview the players on a day that wasn’t a finals day. Huge, rapturous applause rang around Centre Court for Andre, yet this young, brash upstart, by stepping back and joining with the applause, was wise enough even at his young age to realise this wasn’t for him, but for a true legend bidding his farewells to Wimbledon. In stuttering English, he expressed his admiration for Andre and his achievements, then stepped back to allow Andre his moment. That moment of grace and humility struck a chord with me immediately and has never left me. As I drove home to Wales the next day, he was still in my thoughts. And, for the first time in many years, the first thing I checked out online when I switched the PC on was not what Bon Jovi had been up to, but Rafael Nadal. And that search eventually led me to the predecessor of this site, and then to VB itself. 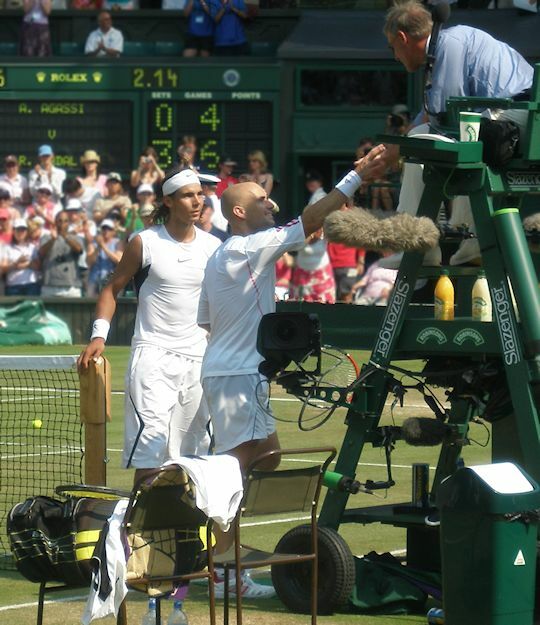 At the risk of veering into sentimentally which I’m not generally predispositioned to, the day I watched Rafa play Andre at Wimbledon changed my life. Getting involved in VB led me to many like-minded people which in turn led to various acts of craziness, like going to Wimbledon with 3 people I’d never even met until the day we met up in London. Pitching a tent on the street to queue for tickets and eating Chinese food under an umbrella held by a complete stranger in a torrential rainstorm while in the queue for said tickets. And quite literally days and nights spent camping, just to get that precious ticket to watch Rafa play. Over the years I’ve made friends with a whole host of people in the UK whom I'm able to meet outside of tennis when time and circumstance allows. I’ve met up with and had shared experiences with friends from all over Europe and beyond, from France, Germany, Serbia, Spain, Belgium, Russia, and even with folks as far afield as the USA, Canada and Australia. Would our paths have crossed had Rafa not brought all our paths together? Not a chance in hell. And all of this stemmed from one little sentence inviting me to watch some tennis. 1st July 2006. Absolutely not a day like any other.